Okieladybug's Scrap N' More: This Should Be Fun! I am going to Linda's, aka LGuild, house this afternoon after going to visit with my aunt. Linda and I are going to order some ribbon from Ribbons And Bows Oh My because they are having a 20% of total order sale, AND...FREE SHIPPING!! YAY! *okie does the - I love ribbon dance*. The sale only lasts through January 1, 2012. Linda and I have been ordering from RABOM for a few years now and absolutely love their product and customer service. They have a great selection of ribbon in all kinds of styles. 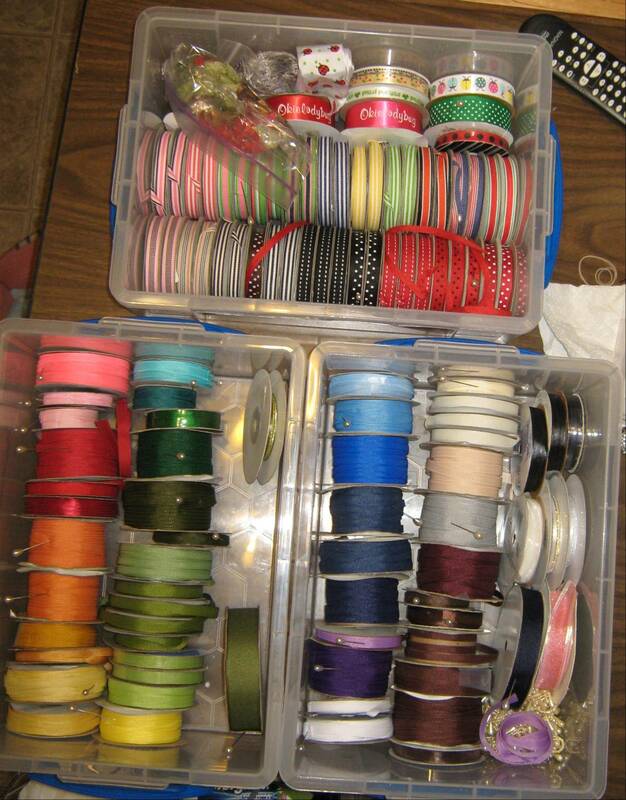 I had to go through my ribbon and see what I needed to order, so that lead me to re-organize my ribbon a bit. Lately I had just been tossing it in the box and not putting it back where it belonged, but now it's all nice and neat...that is until the order comes in and then I will have to start all over again! I keep my rolled ribbon in the Really Useful Boxes since they stack nicely and I got quite a few when they were on sale. I actually want to see if the rolls of ribbon fit in the shorter ones but haven't gone to purchase one yet to find out. 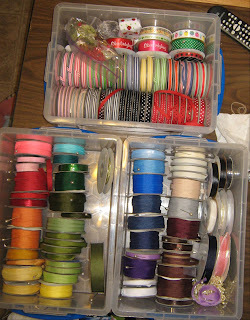 I try to keep my ribbon like I do my cardstock...ROY G BIV, makes it a lot easier to find what I need. I posted a message to Linda about the sale and she called me bossy! *okie just can't believe the nerve of Linda at times* But she also said she did need to order ribbon. We order together because it is cheaper to order in larger quantities and we can split the 20 yard rolls and save money. If you guys are needing ribbon go check out RIBBONS AND BOWS OH MY. Oh and this post is scheduled for after Linda and I order our ribbon. I don't want them to run out before I get my ribbon ordered! *okie grins evilly and rubs hands together feeling so proud of her evil plot*. Sure wish we lived closer so I could share in the order too. I could have some fun with all that ribbon, and prices are very good too. Anyone in central Illinois interested in sharing an order to get free shipping? Okie thanks for giving us the tip on storage of your ribbon and paper. I think I might try that. Also in one of your recent blogs you showed how you wrapped a present with tulle, it had one of the prettiest bows. Wondering if you would show us how you did that? As always thanks for all that you share with us. I have really enjoyed following your blog. No,No,No....I don't need anymore ribbon. My husband is going to hang me with all the ribbon I have. LOL. Well maybe a few rolls won't hurt. Okie- Wishing you a Happy New Year! !